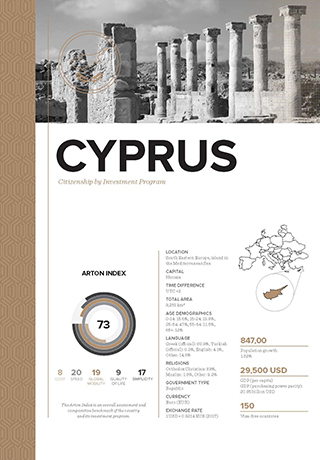 An important hub in the heart of the Mediterranean at the crossroads of Europe, Africa and Asia, Cyprus is diverse, culturally rich and perfectly placed for working and traveling within and beyond the European Union. The economy is rapidly recovering from a recent recession through significant activity in the shipping, tourism, legal and financial services sectors, and has also seen a surge in foreign investments and developments, and property and investment values. Simultaneous submission of residency and citizenship applications. Strategic geographical location forming a bridge between the EU, Middle East and North Africa with direct access to the Mediterranean Sea. Safest country in the world with a population under 5 million. Excellent education system as well as first-rate health care. Offered in accordance with the Civil Registry Laws 2002-2013, the Naturalization of Investors by Exception Programme is one of the fastest to lead to residence and citizenship in Europe. 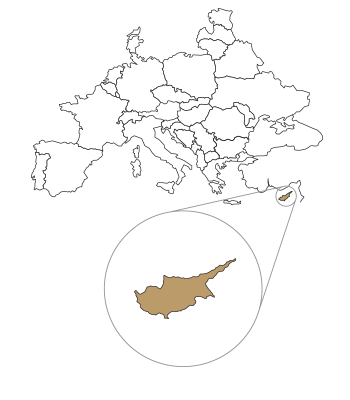 Possess a residency permit in the Republic of Cyprus, for a period of six months before being granted citizenship. Own a permanent private residence in the Republic of Cyprus with a purchase price of at least €500,000 plus applicable VAT. In the case that one chooses to invest in residential properties only and one of the residential properties is priced at at least €500,000, then the total investment amount must be €2 million. Applicants may invest at least €2 million in the financial assets of Cypriot companies or Cypriot organizations. This includes bonds, securities and debentures registered and issued in the Republic of Cyprus. Investors must maintain the purchased assets for a period of three years. Applicants may invest in a combination of the above options. The combination of investments must total at least €2 million.